Building Scientist. Energy Auditor. Social Media Manager. Home Performance Contractor. Sustainability Educator. Emerging Leader. 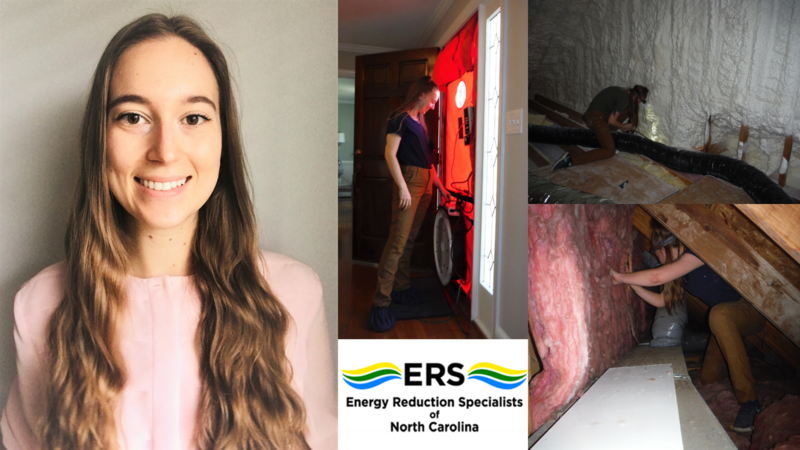 These are just a few of the roles that Rachel Dodgen fills on a daily basis while working at Energy Reduction Specialists in Greensboro, North Carolina. Rachel graduated from Appalachian State University’s world-renowned Appropriate Technology program in May of 2016 and attained a Master of Technology in Building Science soon thereafter. With a wealth of education and an industry internship under her belt, Rachel knew that a career in building performance was for her. In early 2018, she got to work. 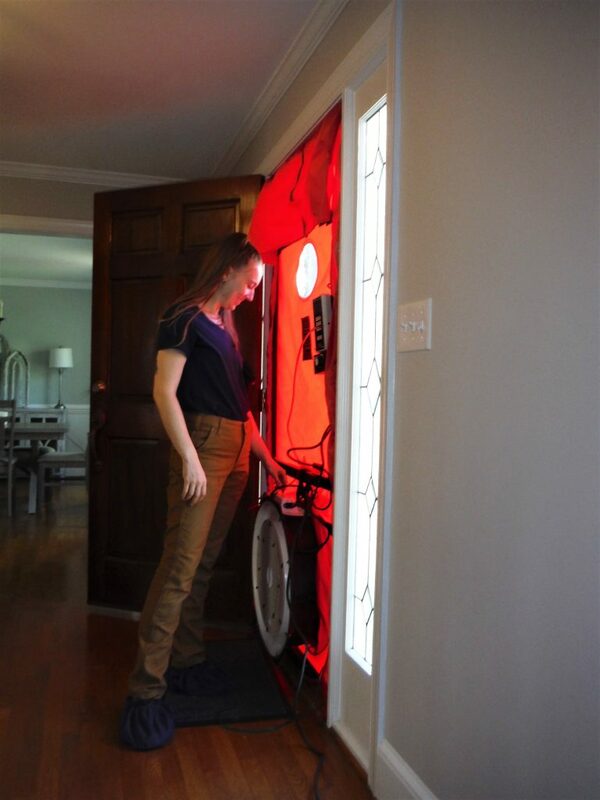 Rachel recently took some time away from hot attics and cold crawl spaces to reflect on her first year in the industry. Below, Rachel describes some of the challenges she’s faced thus far, talks about her motivation and provides advice to other young professionals, students and women on joining the industry. How long have you been in our industry and what have you been doing? I have been in the industry a little over a year since graduating from Appalachian State in August of 2017. My main responsibility at ERS is to perform energy audits and attic and crawlspace inspections and write and deliver reports to the homeowner. As the youngest member on staff I have also become the website/social media liaison and am planning on starting a company blog soon. In the past few months I have also begun training for a HERS Rater certification which I plan to complete before the end of the summer. Before you joined our industry, what did you know about it? I honestly did not know much about the green building industry before I started graduate school. I did not grow up dreaming of being a building scientist or even really knew it existed until I took a building science course as a part of my undergraduate studies. I have really submerged myself now trying to stay as up to date as possible on this ever-evolving industry. 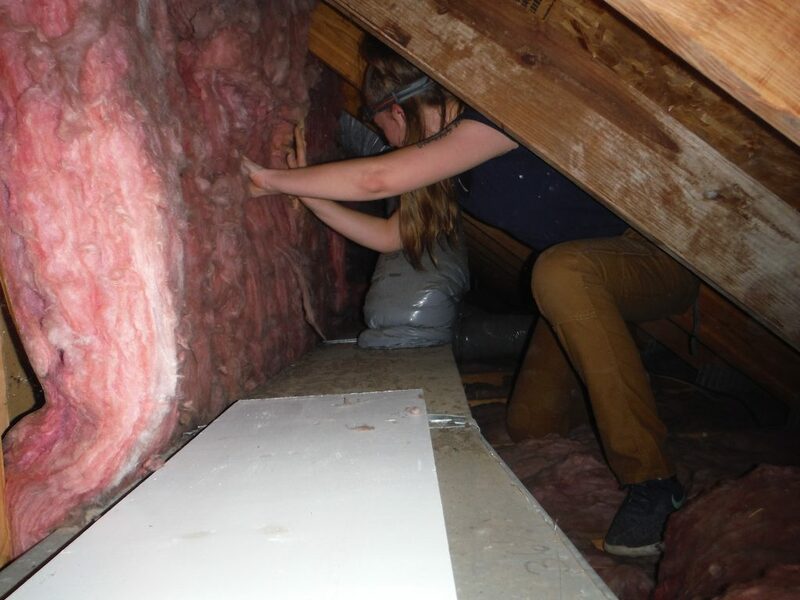 Hot attics and cold crawl spaces are part of the job. Was finding a job easy or difficult? What helped you find your current position? Finding a job was easy, finding the right job was difficult. After graduating I quickly learned that there are about a million different career options in this field from technical to non-profit to sales, and I applied for a large variety. It took some time before I found the right place. Attending conferences and networking events definitely helped me find opportunities for jobs and internships. It is important to get yourself out there and create as many connections as possible. This field is very collaborative and making those connections can really make an impact on your career in the long run. What excites you about working in building performance? The most exciting part about working in building performance is how it is constantly evolving and growing and is an industry that is working to make a difference. Green building and energy efficiency are going to become more and more crucial to our everyday life as we face the ever-growing concern of climate change and the negative effects it has on our lives and planet. I am excited to be apart of something that can truly make a difference. The satisfaction of completing a job knowing that I’ve made a difference not only for that family but for the community as a whole is one of the best feelings. What are some challenges you’ve faced in your career thus far? Almost every homeowner I meet with is surprised that I am a woman and that I am so young. I even overheard a client one day tell my boss that I look like “not even high school,” which does not help my credibility. Most people just don’t expect someone like me to be the person going into their crawlspaces and attics. There is a different attitude when going out on a job with my boss Paul versus going by myself, not necessarily in a bad way, but I am definitely treated differently. Whenever I am alone it sometimes feels like homeowners (especially men) are constantly checking up on me, trying to offer help, and warning me about what I am about to do almost like they doubt my ability to do my job. I am sure part of this feeling is me overthinking it, but I just try to act as professional as possible and ensure them this is not my first time using a ladder or army crawling through a tight crawlspace. 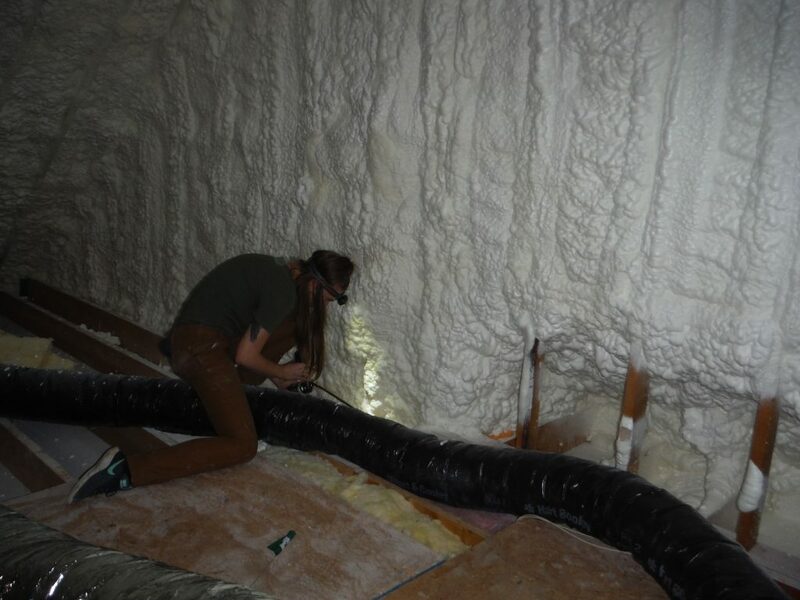 Inspecting fiberglass batt insulation and duct work during an energy audit. What’s the most fun you’ve had on a job site or working with a client thus far? The most interesting house I’ve been to is the first audit I did with ERS. It was a historic home in Greensboro that was over 100 years old. The house was originally two stories, but the second level was closed off during a renovation because the ceilings were not high enough, so we had to climb in through the window on the roof! It was definitely an exciting start to my new job. The closed off rooms were so tiny, and it felt like a glimpse into the past. What kind of career opportunities are you looking forward to? I am looking forward to continuing my education and becoming part of this collaborative community. I am excited to see where this industry is going to take me as green building becomes the new standard. I have always loved sharing and spreading my knowledge and passion with others, so I hope to be able to incorporate that in my future career with some sort of teaching or training position. What advice do you have for women looking to join our industry? Stick to your guns and don’t be afraid to let the boys know your voice. Every meeting, training, or conference I attend is strongly male dominated and it’s easy to feel like you’re invading the boys club. Oftentimes I find myself to be the only woman in the room and sometimes it seems like I am the only one under 35 and doesn’t have 10 plus years of experience, but that doesn’t make my voice any less valuable. It is important to be confident in yourself and know that every woman that breaks this boundary is an inspiration for another to do the same. A stereotype shouldn’t deter you away from what you are passionate about. Connect with Rachel via email at Rachel@ERSofNC.com. Click for more NCBPA member stories and interviews. Student Design Contest for High Performance Training & Career Center – on Wheels!